The 'N' in Sony's NX series of LED TVs stands for Network. This means you'll be able to stream media wirelessly from PCs around your home and access a wide range of web content, all from the comfort of your sofa. The NX series is the step up from Sony's Cinematic (HX) and Essential (EX) ranges, but below the more luxurious Signature (LX) range. There are a grand total of nine sets in the NX series, of which two have the 713 suffix – the 40-inch KDL-40NX713 and the 46-inch KDL-46NX713, reviewed here. In terms of features, the KDL-46NX713 is a great all-rounder. Of primary concern to picture junkies is the use of Dynamic Edge LED, which, like regular edge LED, has diodes along the top and bottom edges of the screen, but introduces local dimming technology to control the light output of certain clusters. Sony says this, in conjunction with the OptiContrast Panel, helps deliver contrast levels so good that it has called it 'GigaContrast'. Elsewhere, it's fully equipped for full HD 3D Blu-ray using the optional active shutter transmitter and glasses, plus it boasts built-in Wi-Fi for full networking convenience and a Freeview HD tuner. 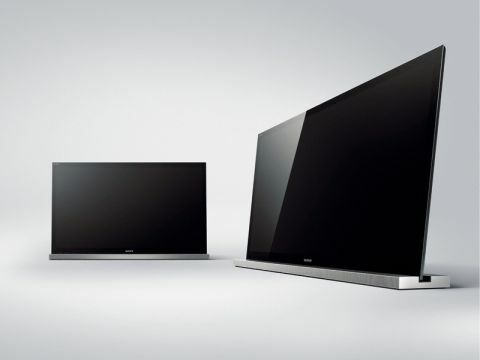 And in terms of aesthetics, it sports Sony's gorgeous Monolithic Design, which uses a glossy black bezel, a flush screen surface and the option of a 6° tilt to hit the optimum viewing angle when placed nearer the floor.